NASA Earth Observatory image by Joshua Stevens, using MODIS data from NASA EOSDIS/LANCE and GIBS/Worldview and VIIRS data from the Suomi National Polar-orbiting Partnership. Story by Kasha Patel. 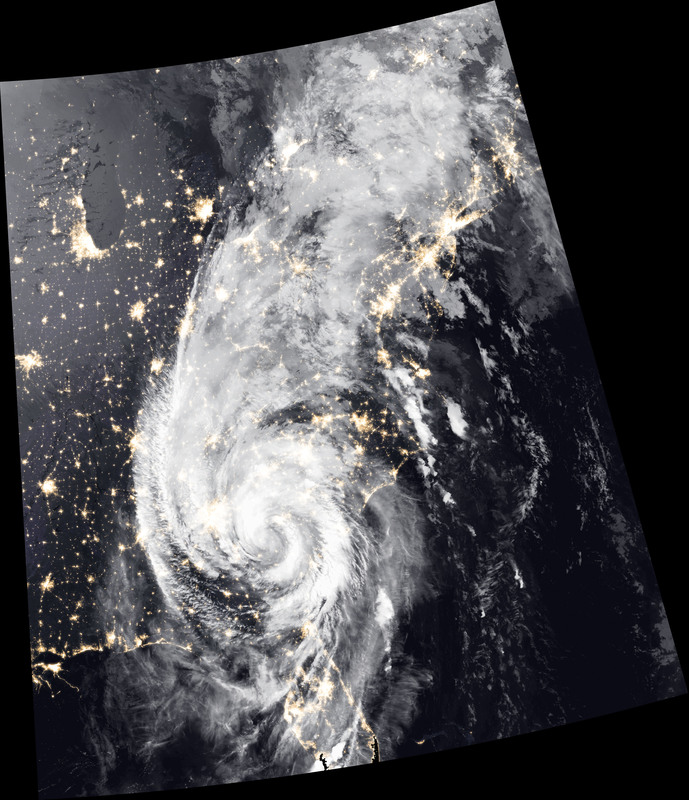 Since making landfall in Florida on October 10, 2018, Hurricane Michael has caused severe property damage and several deaths in Florida, Alabama, Georgia, South Carolina, and North Carolina. 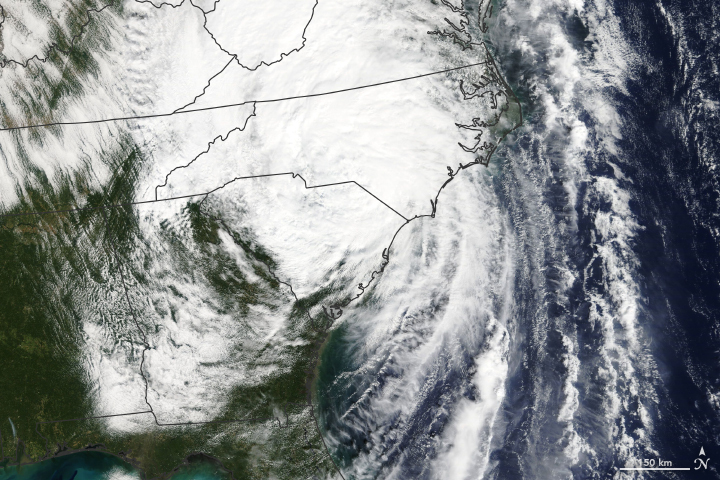 Forecasters expect the storm center will continue to track across North Carolina and Virginia, bringing the potential for life-threatening flash flooding. Michael should move into the western Atlantic Ocean by October 12. 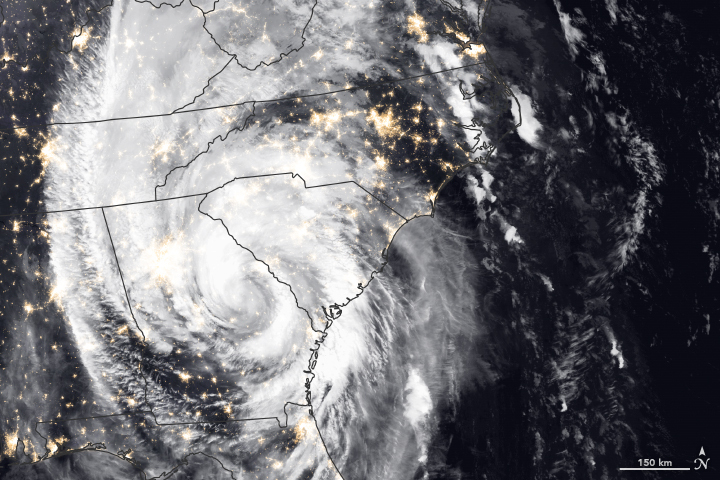 The natural-color image above was taken on the morning of October 11, 2018, as the storm made its way into North Carolina. 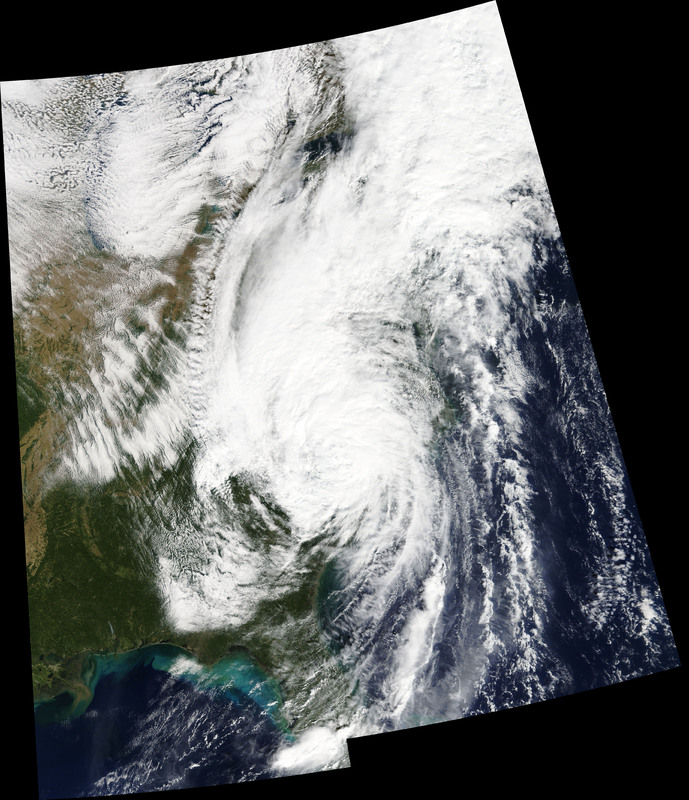 The image was acquired by the Moderate Resolution Imaging Spectroradiometer (MODIS) on NASA’s Terra satellite. According to news reports, the storm knocked out power to hundreds of thousands of homes and radio towers, making communication difficult. Water levels in several rivers in North Carolina and Virginia rose by several feet in a matter of hours and are expected to enter moderate to major flooding stages. The National Weather Service also warned about the potential for tornadoes in North Carolina and Virginia. CBS News (2018, October 11) Michael menaces Southeast after slamming Florida—live updates. Accessed October 11, 2018. National Hurricane Center (2018, October 11) Michael. Accessed October 9, 2018. National Weather Service (2018, October 11) Advanced Hydrologic Prediction Service. Accessed October 11, 2018. NPR (2018, October 11) Recovery Work Begins After Hurricane Michael Carves Through Florida Panhandle.